One of the major problems facing risk assessment at polluted industrial sites and military bases is subsurface contamination by non-aqueous phase-liquids (NAPLs), since tracing the extent of a NAPL plume using conventional methods (drive point profiling) is usually associated with difficulties. In an effort to trace subsurface contamination as precisely as possible, monitoring points are placed in the area that might be affected by contaminants, and groundwater and soil samples are taken to the laboratory for analysis. However, the final number of monitoring points is hardly ever sufficient for distinctive contamination mapping, and this may ultimately result in an unsuitable remediation action being taken. To obtain a more detailed image of a subsurface NAPL plume and, hence, to facilitate remediation measures that are best suited for the site in question, a denser network of monitoring points is desirable. 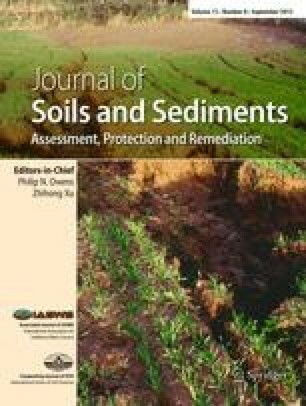 The aim of the investigation described in this paper was therefore to develop a new detection method for subsurface NAPL contamination, which is based on an easily accessibleindicator for NAPLs rather than on the analysis of soil and groundwater samples taken at the site. Based on the good solubility of radon in NAPLs, the idea was put forward that subsurface NAPL contamination should have an influence on the natural radon concentration of the soil gas. Provided this effect is significant, it would be possible to carry out a straightforward radon survey on an appropriate sampling grid covering the suspected site and thus enabling the NAPL contamination to be detected by the localization of anomalous low radon concentrations in the soil. The overall aim of the investigation was to assess the general suitability of the soil-gas radon concentration as an indirect tracer for NAPL contamination in the ground. The partitioning coefficient KNAPL/air is one of the most influential parameters governing the decrease of the radon concentration in the soil gas in the presence of a subsurface NAPL contamination. Since NAPL mixtures such as gasoline, diesel fuel and paraffin are among the most important NAPLs regarding remediation activities, laboratory experiments were performed to determine the radon-partitioning coefficient for these three NAPL mixtures. Field experiments were carried out as well. The aim of the field experiments was to test the use of the soil-gas radon concentration as a tracer for NAPL contamination on-site. For the field experiments, each site was covered with a suitable grid of soil gas sampling points. Finally, the lateral radon distribution pattern achieved on each of the sites was compared to the respective findings of the earlier research performed by conventional means. The results of the laboratory experiments clearly show a very strong affinity of radon to the NAPL mixtures examined. The partitioning coefficients achieved correspond to those published for pure NAPLs (Clever 1979) and are thus in the expected range. The results of the field experiments showed that the minimum radon concentrations detected match the respective NAPL plumes traced previously. Both the results of the lab experiments and the on-site findings demonstrate that the soil-gas radon concentration can be used as an indicator for subsurface NAPL contamination. The investigation showed that NAPL-contaminated soil volumes give rise to anomalous low soil-gas radon concentrations in the close vicinity of the contamination. The reason for this decrease in the soil-gas radon concentration is the good solubility of radon in NAPLs, which enables the NAPLs to accumulate and ‘trap’ part of the radon available in the soil pores. Further research is required into contamination with rather volatile NAPLs such as BTEX. Further research is also needed to examine whether it is possible to not only localize a NAPL plume, but also to obtain some quantitative information about the subsurface NAPL contamination. The authors also believe that additional investigations should be carried out to study the ability of the method to not just localize a NAPL contamination, but also to monitor on-site, clean-up measures.